Andy Gibb, full name Andrew Roy Gibb, was born in England in 1958 (same year as myself) but the family moved to Oz and lived in Queensland. Andy lived with his family and famous Bee Gee brothers until the early 1970s when he went off to busk and work around Spain and the Isle of Man. He wanted to make his own mark on pop music and not ride on the coat tails of his brothers. 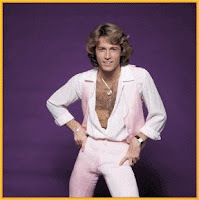 Andy returned to Australia in 1975 to hone his craft as a singer and songwriter, Gibb began recording a series of his own compositions, one of which was released as a single on the A.T.A. label, owned by Col Joye. The first single "Words and Music" would eventually reach #5 on the Sydney music charts in 1976. It was a well orchestrated single. This breakout would pave the way to an even greater milestone later that year - Andy moved to Florida to begin working on songs with his brother Barry. All the American tracks he recorded have been put on C.D. In America, Andy re-recorded "Words And Music", so the version sold on C.D. nowadays is the American remake - not the Aussie 7" hit version…I wonder if Col Joye and co. will ever release Andy's original mixes on C.D.? This download is the stereo version of the 7" single. Enjoy!